Home > real estate > Housing: The Spoiler Alert for US Economy In 2019? Housing: The Spoiler Alert for US Economy In 2019? Yesterday’s scheduled release of US gross domestic product (GDP) for the fourth quarter is still a mystery, courtesy of lingering effects of the partial government shutdown that ended last week. 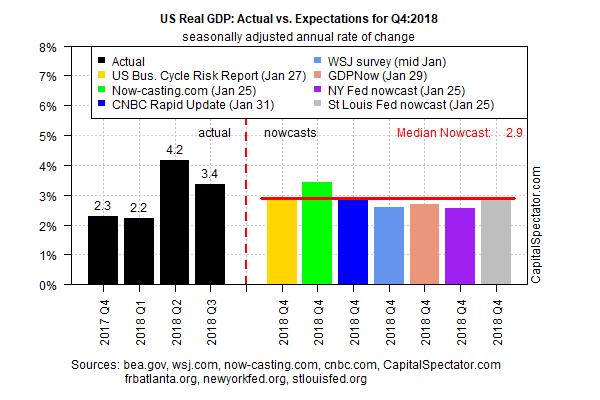 The good news is that whenever the Bureau of Economic Analysis publishes the data (the date remains “to be determined”) the results are likely to show that the expected slowdown in Q4 growth was moderate. The question is whether the trend will continue to decelerate this year? The jury’s still out, due to limited 2019 data published so far. Let’s start with the current profile for GDP in Q4. The median estimate for a set of nowcasts compiled by The Capital Spectator is still holding at a 2.9% increase (seasonally adjusted annual rate) for the final three months of 2018. That’s unchanged from last week’s estimate (published on Jan. 25). That translates to a moderately softer gain vs. the 3.4% increase in 2018’s Q3 and Q2’s strong 4.2% rise, but for now it appears that a moderate growth trend prevailed at the end of last year. For this year, a new survey from The Wall Street Journal indicates that the deceleration in output will continue in Q1. Economists are currently projecting that growth will dip to a relatively weak 1.8% in the first three months of 2019, the Journal reports via a poll this week. Meantime, yesterday’s January report on private-sector payrolls via ADP paints a brighter profile. US companies hired 213,000 workers this month, a solid gain that translates to a strong 1.9% year-over-year increase. The upbeat data implies that tomorrow’s official jobs report from the Labor Department for January will deliver encouraging results too. Econoday.com’s consensus forecast sees the government reporting private payrolls increased 160,000. Although that’s well down from December’s stellar 301,000 surge, the projection for January translates to a solid 2.0% annual rise, marking the second straight month at that pace. Pending home sales continued to trend lower, falling 9.8% year-over-year in December – the 12th straight month of annual contraction. Existing home sales in December fell to their softest level since 2015. The annual trend for new residential construction has been negative as well: housing starts declined modestly in year-over-year terms for two straight months in October and November. The government shutdown delayed the December update, but economists are expecting a rebound in the one-year trend to a modest increase of almost 4%, based on the implied estimate via Econoday.com’s consensus estimate for the monthly change, which is expected to remain flat compared with November. A weaker-than-expected number, however, would raise concern that the housing market is set for a rough year in 2019. Adding to worries for the economic trend in 2019: the sharp drop in consumer confidence in January, which slumped to an 18-month low, according to the Conference Board. The weakness may be temporary, however, due to the government shutdown that ended last week. The case for optimism for this year’s first quarter, in other words, rests largely at the moment on upbeat data for the labor market via ADP’s January profile. The first question: Will tomorrow’s Labor Department data offer corroboration? The crowd’s expecting no less. The burning question, of course: Will the incoming data will confirm Silver’s analysis?